Despite being kicked out of his home after getting into a fight with his mother, Casey Snow recalls feeling defiantly optimistic when, at the age of 18, he was finally living on his own. That was until Snow began experiencing twisting stomach pains that lasted for hours, just three days after his coverage under his mother’s insurance ended. He was going to simply tough it out and then “go home and sleep it off,” Snow says, but hen he vomited blood. That’s when he discovered his appendix had burst. And along with the physical pain he experienced, Snow learned how easy it is to ruin your credit when you rack up $21,000 in medical bills without insurance. Snow is now 26 and hasn’t put a dent in those bills. “I could be in a completely different place now if I had better credit,” Snow says. “I may have gone to school sooner.” He’s a student now, working toward becoming an illustrator in a field that will pay enough pay to allow him to settle his old debts. Snow learned pretty quickly that his previous good health didn’t make him bullet-proof, but that’s still an illusion that millions of other young adults cling to. President Barack Obama’s Affordable Care Act is seeking to convince those who believe that youth means never having to pay for health insurance to think again. “Even if you don’t think you’re going to get hurt, health insurance protects you from financial catastrophe,” says Jason Stevenson, director of the nonprofit Utah Health Policy Project. This “young immortal” demographic is exactly the target audience for the health-care advocates who are trying to enroll Utahns in the ACA before the March 31 open-enrollment deadline. After March 31, those who aren’t enrolled will face a penalty when they file their taxes of $100 or 1 percent of their adjusted gross income—whichever is higher. Stevenson coordinated an ad campaign that launched in late 2013 to encourage Utah youth to enroll. 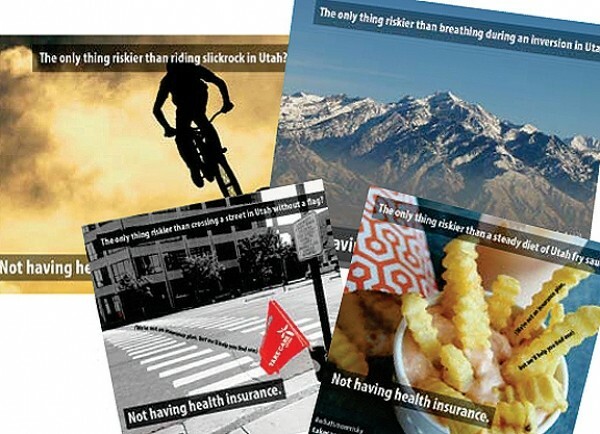 The ads ask, for example, what’s riskier—braving Utah’s infamous inversion or not having insurance? His organization has dedicated “navigators” who have been working to help enroll Utahns under the ACA. UHPP’s navigators often work directly with clients who struggle with English as a second language or lack access to the Internet, but when it comes to the youth the challenge isn’t navigating the much-criticized complexities of the HealthCare.gov website. Stevenson says that Utah has actually had success in enrolling a younger demographic, but says that may have more to do with the state’s population than with the appeal of the program. “We have the highest percentage of 18- to 34-year-olds in the country signing up,” Stevenson says. “But we also have one of the highest populations of young people.” That demographic accounts for 31 percent of Utah’s enrollment, but it also includes a large number of college-age students 26 years or younger who are now covered under their parents’ insurance under the ACA. As for Snow, he now has insurance through his wife and personally would be more in favor of a single-payer system of health care. And despite promising enrollment numbers, Stevenson has encountered other surprising anti-ACA attitudes. He recently engaged in an online discussion thread on the Facebook page of David Brooks, director of Salt Lake City-based Revolution United, a popular social-justice advocacy group. Stevenson says he was amazed to discover how unpopular the ACA was with many of the progressive, liberal Salt Lake City whippersnappers. Stevenson says in chatting with members of the Facebook page, whom he assumed would have been easy enrollments, he found a disconcerting mix of “young immortal” thinking along with a strong libertarian disregard for big government. One commenter told Stevenson that she could take care of all of her health needs with yoga and meditation. “Next time you break your leg, tell me how yoga works out for you,” Stevenson says. Stevenson says the message he and others hope to get across is that instead of paying hundreds of dollars in a tax penalty, many young Utahns could be paying as little as $20 a month for health insurance that could protect them from life’s curveballs. “Even if you heal pretty quick, your credit scores probably won’t,” Stevenson says. Editor’s Note: This is the third in a series looking at how enrollment in the Affordable Care Act will affect different members of Utah’s communities.